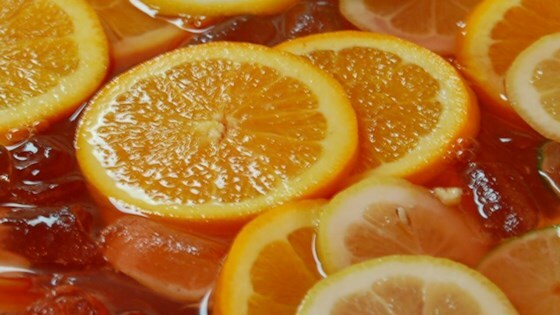 "Sparkling apple cider, fresh orange juice, and lemonade concentrate blend into light and refreshing non-alcoholic punch in this easy recipe." Thinly slice the lemons and the oranges and place in a large punch bowl. Pour in the thawed lemonade. Gently stir in the club soda and the sparkling apple cider. Add sugar to taste. Add ice. I made this punch for a bridal shower last week and everyone loved it. We couldn't get the punch bowl refilled fast enough! Light & refreshing! Punch has been a hit everytime I've served it. I always seem to run out not matter how much I make. Will make again & again. I doubled the recipe, which filled the punch bowl perfectly. It tasted pretty good, but not the best punch I've ever had.